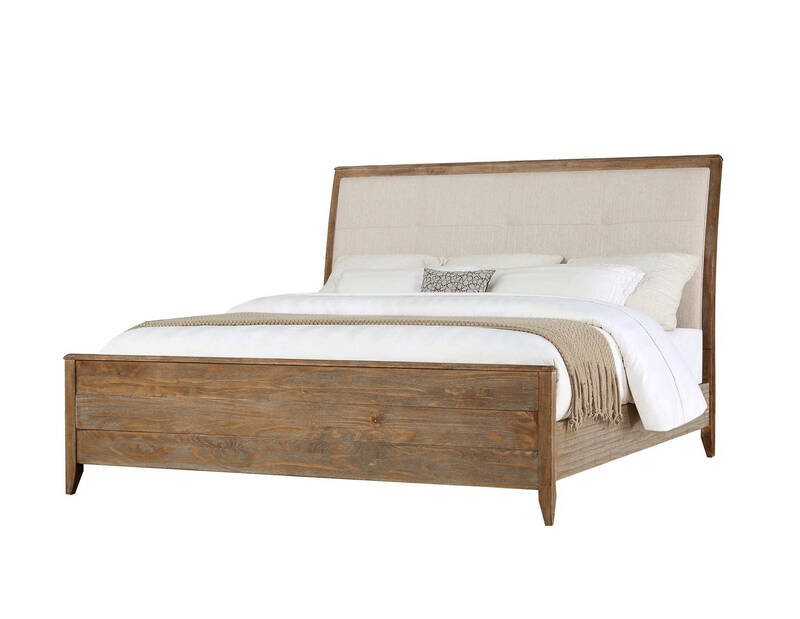 The Torino king bed brings an eclectic look to the bedroom with rugged materials and refined design. Eclectic, which has for years been the decorating influence, might also be defined today as polar opposites and that is the inspiration for Emerald Home's newest bedroom collection, Torino. A rugged wire brushed face with lapped slats and brushed nickel hardware giving a feel of the rustic outdoors is brought uptown with a soft upholstered panel headboard and a natural washed gray finish with linen highlights supported by a tapered leg. Pine & Rubberwood solids and extra thick pine veneers are deeply wire-brushed, finished in a natural sandstone and then blended with a soft linen hue. Heavy slats are lapped on the fronts of the cases adding weight and interest to this design. Keeping with the natural theme of the Torino bedroom collection the hardware is a simple horizontal pull in brushed nickel.